Fig. 1. Fluoroscopic correlation. 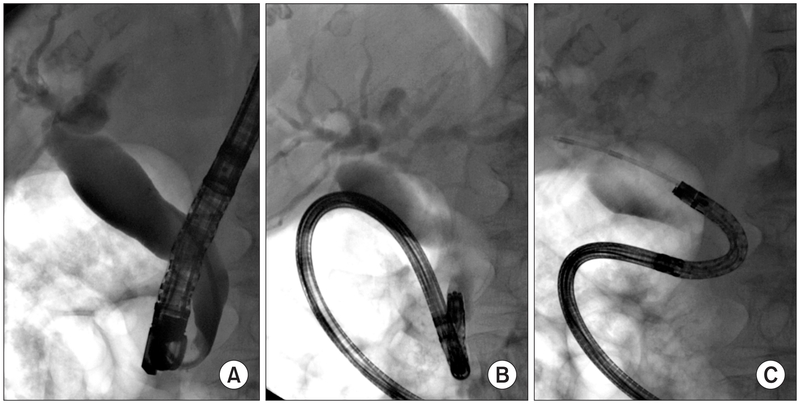 (A) Dye cholangiogram demonstrating marked common bile duct (CBD) dilation up to 25 mm without filling defects or definitive stone detection, which, however, remains questionable in conderation of the well-recognized decrease in sensitivity vis-à-vis diffuse biliary dilation. (B) Direct cholangioscopy in pure freehand fashion succeeded in intubation of the papillary orifice; however, the ultra-slim upper endoscope (Fujinon EG-530NW; Fujifilm) repeatedly slipped out into the duodenum due to axial deviation, complicating instable scope positioning and “red out” situation blurring visual control. (C) Successful deeper intubation of the CBD after identification of the route and axis as well as scope stabilization with the “balloon-catheter-cannulation technique”.